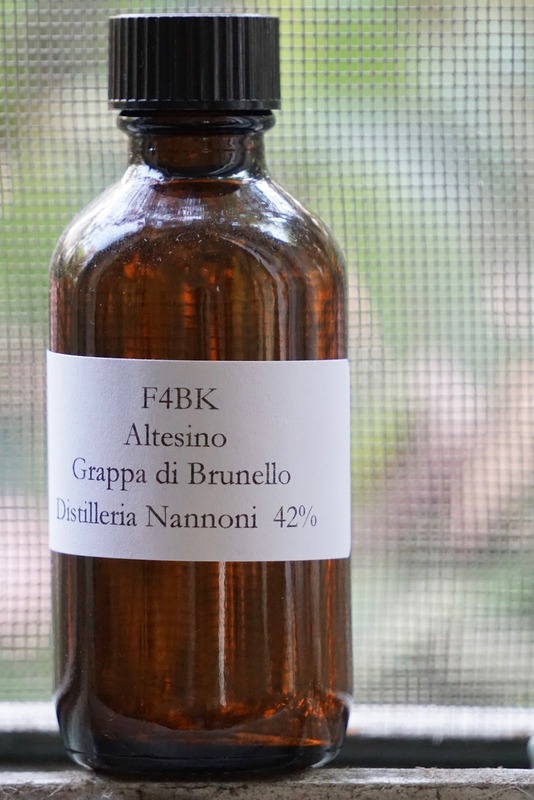 Altesino Grappa di Brunello (42.0%): Lately it's being very hot here in SoCal and it's hard to drink whiskies but pouring a Grappa sample into my glass sounded like a good idea... It's one of my favorite spirits after all. This one is distilled by Distilleria Nannoni in pot stills for Altesino estate using the estate's own Sangiovese di Montalcino grape pomace. The spirit is matured in various casks for a period of a short time before being bottled. Color: Almost clear with a barely noticeable yellow tint with very slow moving fat legs. Probably the casks used for maturing were un-charred neutral wine casks or maybe they were used multiple times before. Palate: Surprisingly sweet on the palate after that slightly bitter and vegetal nose. Vanilla, rice pudding and flan. Honey syrup and mint drops. Good and textured mouthfeel but hard to believe that it is so sweet naturally. I wonder if the casks used have to do anything with this creamy and sweet flavor profile. Finish: Medium... Green apple flavored sparkling water and eucalyptus. Overall: This is a tad too sweet for my palate... Not exactly what I would expect from a Grappa when I order one. I am more for punchy, bitter and vegetal ones. For what it is worth it does tastes great though but not exactly for me. It would be a great one to pour for somebody who thinks that he/she absolutely hates pomace brandies. Thanks to Florin for the sample.